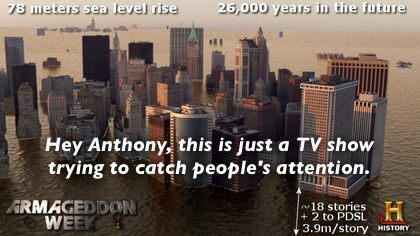 Freaking out about NYC sea level rise is easy to do when you don’t pay attention to history | Wott's Up With That? “Freaking out about NYC sea level rise is easy to do when you don’t pay attention to history“. This is funny. Anthony Watts talking about “paying attention”! Apparently he’s seen some photoshopped what-if visuals on the History Channel that he thinks prove that climate scientists are liars and that the “mainstream media” is in on it too. Further more that we can adapt to anything, including Global Warming (which isn’t happening). The more trivial and less scientific something is, the more Anthony will take offense to it. His battle is entirely about the “optics” of the Global Warming debate. It’s funny though that Anthony doesn’t understand “creative license” in the media. His heroes Lord Monckton and Ian Plimer, specialize in it. This entry was posted in Uncategorized and tagged MSM by Ben. Bookmark the permalink. NYC has a current, and historic, vulnerability to rainfall and storm surge flooding. In Hurricane Donna (1960) the water level at the World Trade Center site was almost waist deep. NYC is a city of eight million people living over subways, tunnels, and underground utilities. New Yorkers are only thinking about the shallow years.